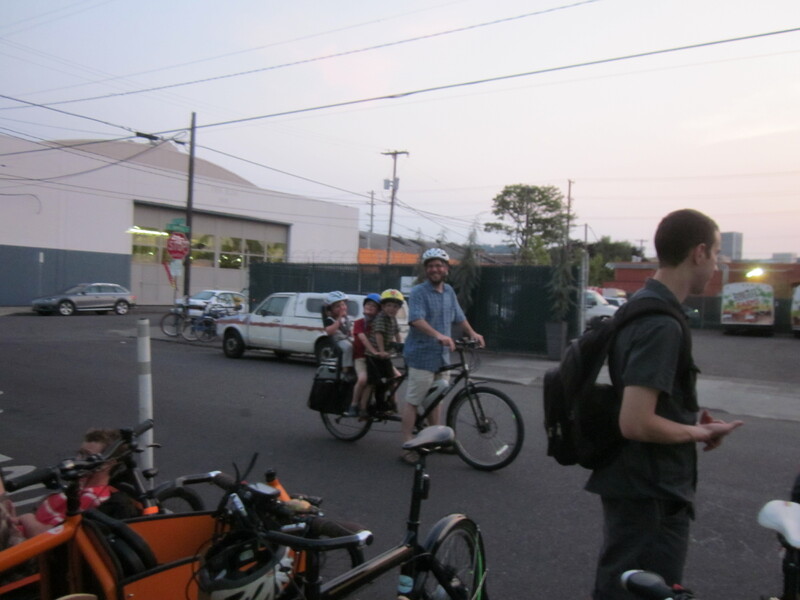 Matt takes three kids for a spin on our rental Big Dummy at the Portland Cargo Bike Roll Call. Over the last year I’ve had the chance to ride a Surly Big Dummy multiple times, both with and without an electric assist. Our friends from school have lent theirs, and Family Ride has let me use her incredible pink Big Dummy for long rides in Seattle. And twice I’ve ridden a BionX assisted Big Dummy from Splendid Cycles (the first electric-assisted bicycle I ever rode), once for a day and more recently, for a week. 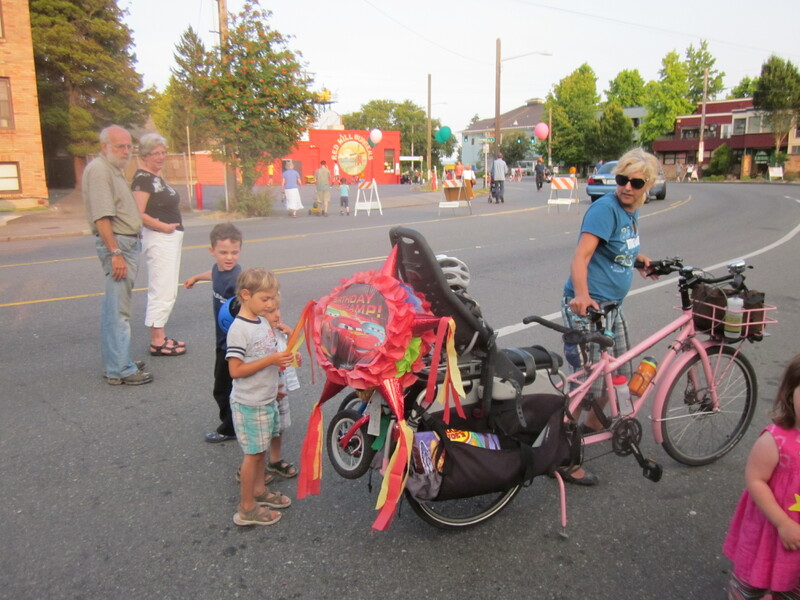 The Big Dummy makes frequent appearances in family biking communities in the hilly cities of the northwestern United States. The Big Dummy grew out of the Xtracycle platform. Xtracycle pioneered the longtail bike concept in the United States with the development of the FreeRadical, which is a longtail attachment that can be fitted to virtually any bike, even a folding bike (useful for people who want cargo bikes, yet live in small apartments with limited storage space—preassembled versions are sold by Warm Planet Bikes in San Francisco). I met someone while commuting home last year who claimed he was riding with one of the first FreeRadicals ever sold. He had his daughter on deck in a child seat, but he had the bike for over a decade. The original wooden deck looked a bit battered but it was working fine. Xtracycle’s system is open technology. Surly was the first company to turn Xtracycle’s FreeRadical attachment into a complete bicycle frame. The advantage of having the longtail as part of a complete frame is basically the same advantage of having a complete cargo bike rather than a bike and a trailer, although less dramatic. The FreeRadical is really a separate part, so it’s harder to carry as much weight, and the bike can flex, particularly on hills. Flex means that different parts of the bicycle no longer move in the same plane, which can be disconcerting; under challenging enough conditions, the frame can even break apart. Typically flex is not a big concern for people commuting to work on bicycles, because they’re traveling relatively slowly and they don’t weigh that much. But put a hundred extra pounds on the back of the bike and head up or down a steep hill and suddenly you do have a problem. Because we live and work on San Francisco hills and want to carry kids whose total weight is approaching 100 pounds, we were discouraged from riding an Xtracycled bike on the grounds that it would not feel stable—70 pounds is apparently where people start to feel the flex, and our kids together weigh more than that. This concern includes Xtracycle’s Radish, which is a bicycle frame attached to a FreeRadical; purchasing a Radish is mostly a way to get a FreeRadical without already owning a donor bike. However there are many San Francisco families in flatter parts of the city who are very happy with Xtracycled bikes. One family we met attached their FreeRadical to a tandem bike after their kids got too big for the Xtracycle to carry them safely. However they report that the Xtratandem is extremely tiring to ride. The issues that kept us from seriously considering the Xtracycle FreeRadical/Radish are much less significant with the Big Dummy. Because the bike is a complete frame, it has far less flex. 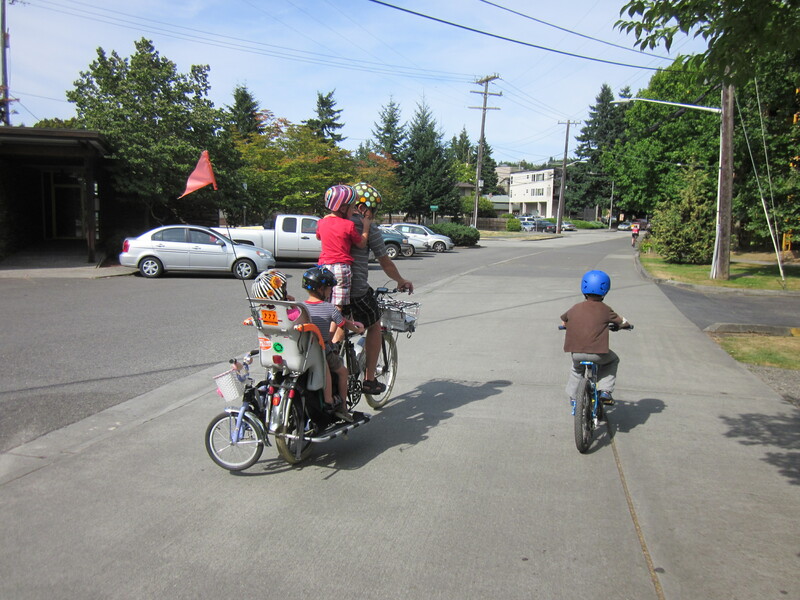 Getting a Big Dummy would also allow us to feel solidarity with our family biking neighbors to the north, because these bikes are all over Seattle. And although getting a Big Dummy so I could feel like I have something in common with other family bikers is arguably sort of pathetic, getting the same gear as Family Ride actually has real merit as a decision rule, because she rides everywhere. The Big Dummy is very easy to ride. There is almost no learning curve; the first time I got on one I just started riding. The first time I rode one with my kids on board was a little trickier; when they get excited, as they always do when trying out a new bike, they jump around a lot. Dynamic loads are much more hassle than static loads. But nonetheless I managed it pretty quickly, and by quickly I mean less than a block. It also corners pretty neatly, even when laden, although with a load all longtails are going to swing out a little wider. The Big Dummies we’ve ridden have really nice components, which make them a pleasure to ride. Shifting is instantaneous, braking is fast and effective, and the bike rides smoothly. The Big Dummy can climb! Family Ride has taken me up the hill to her place a few times now; it’s a long and moderate grade of ten blocks or so. In March, riding that hill on her unassisted bike with my kids was no problem, although I wasn’t breaking any land speed records, and for most of it I didn’t need the lowest gear. In August, when it was significantly hotter, I wilted. She had my son and her youngest on Engine Engine Engine while I had her oldest and my daughter on the Big Dummy, and they dropped me like a lead ingot. It never gets hot in San Francisco. But I made it eventually. On this trip I really started to notice the difference between fast cargo bikes and slow cargo bikes. These are relative terms; no cargo bike is going to go fast by the standards of a road race. The Big Dummy is a fast cargo bike. I really noticed it when I was out with Biking with Brad and Family Ride, both on their Big Dummies, while I was riding the Madsen, which is definitely not a fast cargo bike. When I rode a loaner MinUte in Seattle with my kids and Family Ride was back on her Big Dummy, we could cover serious territory. Maybe I should learn to relax a little and enjoy the ride, but I decided instead that I like the fast cargo bikes. Yes, that is a pinata. I am not worthy to hang out with these people. It is astonishing what you can pack on a Big Dummy (this applies to the entire Xtracycle line). The standard bags on the bike, which are called FreeLoaders, fold flat when not in use, expand only as much as needed when loaded, and can carry more than the trunks of many cars the way that Family Ride packs them. She said she got compliments on her loads from homeless guys with shopping carts. Now I have something in common with Seattle’s destitute. Two kids, dozens of pool toys, a large bag of snacks, four towels, a change of clothes for four kids? No problem. Two kids, two kids’ bikes, a piñata, another large bag of snacks, and various other odds and ends I’ve forgotten? Also no problem. Xtracycle, like Yuba, has side bars to keep a heavy load from dragging on the ground or to act as footrests, but they are optional and detachable. I would never use them in San Francisco because I hate having extra width behind me while negotiating narrow bike lanes (personal preference), but they would be useful in other locales. We also liked the FreeLoaders more than we had expected when we rode the Big Dummy in Portland, although unlike a box bike, you do actually have to load them; it’s not throw and go. Oh the humanity. When using the BionX assist, the Big Dummy made us feel like we had cycling superpowers. Normally riding a cargo bike means accepting that even without the kids on board we’ll be slower than everything else on the road, except maybe people on crutches, if only because the bike weighs a lot more. The apartment in Portland we stayed in for the week was almost six miles from where we wanted to be most of the time, because there was an international tree climbing competition in the neighborhood that week (Portlandia!) and basically everything in the city was booked. So we had several evenings when we stayed out later than we should have and had to book back all that way with two tired kids. On Portland’s neighborhood greenways, which allow bikes to go for dozens of blocks without hitting a single stop sign, we could crank up the BionX assists and make it home faster than we’d ever dreamed. “Wow!” Matt yelled at one point, “You know those times when you’re running late and wish there was some magic way you could get there on time? NOW YOU CAN!” Also, being able to hit the throttle and make it through busy intersections with no drag from cargo could be worth the price of an electric assist all by itself. I love the BionX. I would sell our car for one. Oh wait, we already did that. Never mind. Like the Mundo/elMundo, the Big Dummy is pretty short for a cargo bike at about seven feet long, and when not fully loaded with packed bags or the Wide Loaders, it’s also the same width. It can be parked at ordinary bike racks. Bumping it up onto a curb is not a big deal. We ride in the city and this kind of maneuverability is very appealing. As with all cargo bikes except possibly midtails, carrying it up stairs is a complete non-starter, so some kind of walk-in parking is a must. But as with the Mundo or Bullitt, almost walk-in parking would probably be okay with the Big Dummy. Three kid party on the Big Dummy! And that’s my son riding his first geared bike alongside. Like most of the longtails, it’s possible to carry three kids on this bike by putting an infant seat on the front and two kids on the back, with or without child seats. As with the Mundo we have on occasion piled three kids on the back of Big Dummies but this is more of a “riding with friends” than a “riding with siblings” kind of thing. Riding packed tightly on the rear deck of a bike with friends is a nonstop party. Riding packed tightly on the rear deck of a bike with your sibling(s) is an opportunity to get payback for whatever imagined slights happened earlier in the day. The Big Dummy is designed to use the Xtracycle line of accessories , which can be overwhelming but is also fantastic. In addition to the extremely cool bags, the child seats that attach to the deck (Yepp) are very swank; they are rubberized with drainage holes to shed water easily, and very nap-inducing for tired kids, although unfortunately, like all rear seats, they are not very nap-friendly once the kids actually fall asleep, as their heads loll forward and they jerk awake, etc. New accessories like the Hooptie give every kid on the deck a handhold. People who like carrying even more stuff can attach an actual Side Car. The catalog is too deep to do justice to here. Unlike many cargo bikes, the Big Dummy comes in multiple frame sizes to fit shorter and taller riders. Just like with t-shirts, one size fits all means that for most people the fit is not going to be great. So you can adjust the seat, but the handlebars may still be too close or too far away, or it can be hard to stand over the top tube. With this bike, fit shouldn’t be a problem. The kids in back are behind you, by design. This is less fun than having the kids in front, and it means it can be hard to intervene during arguments. With two kids on a longtail the fighting is nowhere near what it can reach on a midtail, with the kids right on top of each other, however. I don’t mean to imply that my kids fight all the time; they actually get along very well. It’s just that the fights stick with me, plus they can totally ruin a ride. Even more than other longtails I have ridden, it is hard to hear the kids in back. A conversation I attempted to have with my daughter on one ride illustrates the problem. “Mommy?” “Yes?” [car passes us with a SWOOSH] “I’m sorry, sweetheart, I didn’t hear you when the car passed. Can you say that again?” “Okay. Mommy?” “Yes?” SWOOSH. “I am so sorry. I missed that again. Could you please say it one more time?” “Okay. Mommy?” “Yes?” SWOOSH. ARGH! The stock kickstand on the Big Dummy is dreadful. It is barely better than the kickstand on a commuter bike. We both hated that we couldn’t trust the bike we rode in Portland to hold any cargo unless one of us was holding it upright. It made loading the bike without two adults around nearly impossible. There is an excellent solution: the appallingly-named aftermarket Rolling Jackass centerstand, which deploys with a hand control on the handlebars (sheer genius!) and releases when the rider rocks forward. The Rolling Jackass is the best longtail stand I have ever seen, the only stand even in the same league as the Bakfiets/Bullitt stands, and I would not get a Big Dummy without it. Too bad it costs $350, not including installation. Xtracycle also sells a KickBack center stand for $150. The Rolling Jackass is better. Even with the Rolling Jackass-enabled Big Dummy (I feel like a mean drunk throwing around all these ridiculous product names), my three-year-old daughter could not get herself onto the bike. This isn’t necessary but it’s nice when the younger ones can get in and out by themselves. The Xtracycle line of accessories focuses on stuff that attaches to the longtail, and pretty much ignores the front of the bike. Surly isn’t traditionally a company that’s focused on the cargo biking community, and thus the Big Dummy does not have a standard front basket or rack. There are all kinds of aftermarket front baskets and racks, but almost none are frame mounted, like the Yuba Bread Basket. Frame-mounted baskets can carry more weight and loading them up doesn’t knock the bike off balance. Having no option for a front frame-mounted rack or basket is an annoying oversight on the Big Dummy. Yuba is on a real tear when it comes to developing desirable family bikes because of accessories like the Bread Basket. There is no rain cover or sun shade for kids riding on a Big Dummy. Some handy parents have developed their own using plumbing supplies and sewing machines. The Yepp seats have lots of holes to use as attachment points. I’m not a handy parent. Classical scholars among us will recall the story of Milo of Croton, who taught himself to carry a bull using progressive resistance training, lifting a calf every day from the day it was born until it grew up. At which point he killed and ate it. I digress. I thought of Milo because of the difference in my experience riding the Big Dummy in March versus in August. Together, my kids were ten pounds lighter in March. I had a lot more trouble getting the bike uphill in August. Some of that was the heat, but it was easier when I swapped out my oldest for Family Ride’s oldest, who is several pounds lighter. I began wondering whether being able to carry my kids at their current weights and beyond was the kind of thing I could work up to, or whether they were already near the limit of what I could reasonably carry on the bike. My go-to source for questions like “how much can the bike REALLY carry?” is the excellent summary of cargo bikes by Joe Bike. It said that the Big Dummy was stable with loads on the back up to 100 pounds. Hmm. With my kids plus their gear, we were already at the 100-pound mark, with years of riding to go. An electric assist would make it easier, but was I going to be pushing the bike beyond where I should? I have already broken one bike. That’s how we got here. 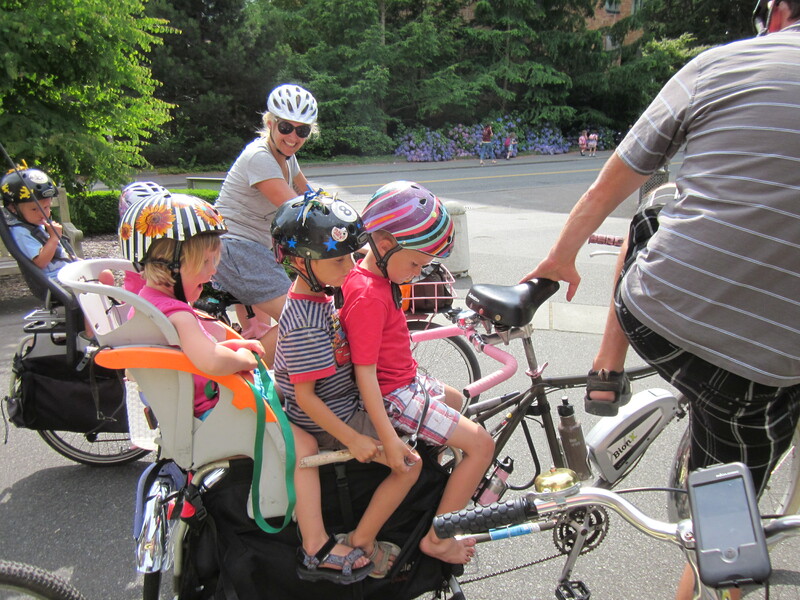 On the other hand, I saw some riders, including my own husband, carrying three kids on the Big Dummy for short trips at least, and together those kids surely weighed more than 100 pounds. So this was hard to assess. We dumped the kids on the Big Dummy when we lost control of the bike trying to start on mild hills. I did it on Family Ride’s bike. My son ended up with a bad scrape. After he saw the blood, he insisted on riding Engine Engine Engine for the rest of the day. I felt horrible. Matt, showing far more foresight, dumped the kids and the bike on some grass alongside the road, and they were shaken but fine. For some reason bikes with the weight on the back are much easier for us to tip. Sure, everybody does it sometimes, but twice in one week was a little more often than I like to admit. The Big Dummy has a high top tube rather than a step-through frame. I hesitate to call this a con because the top tube is what makes the frame strong and there are different frame sizes so it should fit even shorter people. Yet even the smallest frame could be an issue for people closer to the five foot mark (not us), because at some point you’d have to lean the bike to swing a leg over the top tube. That would be a recipe for disaster with two kids on board, and as noted it’s not possible for kids of all ages to get on by themselves after the rider gets on. Like most of the cargo bikes we tried that were not the Bakfiets, the Big Dummy lacked many of the accessories that commuting easier. The bike we rode in Portland had fenders, but no lights or chain guard. Family Ride has wired her Big Dummy with dynamo lights, but has struck out trying to find a chain guard. I bike to work in dress pants several days a week. I want a chain guard. It does not seem like that much to ask. The Big Dummy is one of the more expensive longtails at $2000 for the base model we rode without assist, $3500 with the BionX assist. You get some very nice parts for that price and I don’t think it’s unreasonable, but it is still almost $1000 more than a Yuba Mundo. The accessories we’d want for hauling two kids (child seat, bags, etc.—the Xtracycle Family package, plus stoker bars for the oldest) looked to run about $650. A Rolling Jackass center stand would add $350. So an assisted Big Dummy set up to haul our kids and groceries would total about $4500 (before adding dynamo lights). 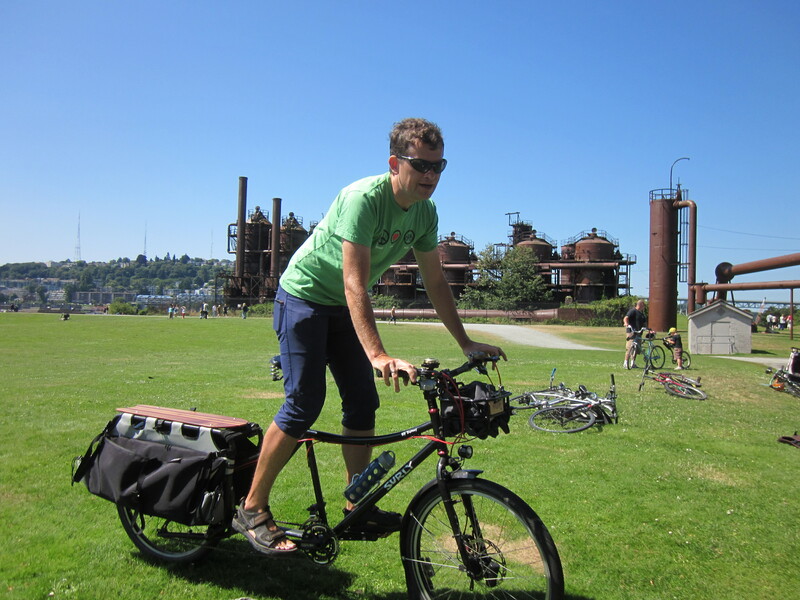 This the the Big Dummy we rode in Portland, looking very staid in comparison to its siblings in Seattle. The Big Dummy is a great bike, but it didn’t completely sweep us off our feet (a turn of phrase one could use literally in this context). I assumed coming into our cargo bike test rides that we would ride a bunch of bikes and a clear and obvious choice would emerge. And I thought it was most likely that bike would be the Big Dummy. This didn’t happen. The Big Dummy could clearly work for us, but we had some nagging concerns. Our experience riding the Big Dummy made me wonder about riding it on the hills in San Francisco. In Portland, even Matt had to crank up the assist to the highest level to comfortably make it up the biggest hill we found when he had both kids on board. And there are much steeper hills than that in San Francisco, and the kids are getting bigger. However it was really hot in Portland (100 degrees) and we nearly passed out from that alone. It will never, ever be that hot in San Francisco. It is a major news event when it gets to 80 degrees here. And families in Seattle are obviously getting their heavily loaded bikes up some serious hills. And I got an unassisted Dummy up some of those hills with two kids on board when it was cooler. So maybe this wouldn’t be a problem. Five kids on two Big Dummies. Who wouldn’t want to join this kind of party? Another issue that bothered us was that we both dumped the kids. If it had been just me, I wouldn’t have worried as much. But Matt has much more upper body strength than I do, as well as more experience with heavier loads, and we did not expect that that would happen with him. We both felt very wobbly on the front loading box bikes but we never dumped the kids. We both felt confident on the longtails and yet we kept dropping the kids. I had no idea which issue would be easier to resolve. Stuff like this can really mess with your head. I suspect that it is unsatisfying to read: “We tried a dozen cargo bikes and after several days we still didn’t know what to buy.” I know that it was incredibly frustrating to experience it. Yet we did eventually choose a cargo bike. Huh. My 2yo can get on and off the bike by himself. He just uses the foot pegs (which are actually recycled bar ends that Madi gave me… and which she found for $1 used) and the stoker bar. I haven’t dumped them yet, but it’s been close sometimes. I think the problem with the Dummy is that it’s meant to carry weight low, at wheel-level in those amazing Freeloaders. Adding the kids on top makes it top-heavy in a way it wasn’t really designed to accommodate. I don’t like that feeling. I have my Yepp on the farthest setting possible from me, which allows for the two kids to ride without killing each other most of the time (spaaaace). Full disclosure: If the big one wears a hoodie, we have to tuck the hood in or there will be choking. Those foot straps are super handy because without them there would be a lot of kicking. They are very very far from riding peacefully with both unrestrained, although I dream of the day when they can just climb on and there’s a Hooptie. When riding with friends, we swap kids and that seems to make things all better, but it’s not foolproof. For us, it’s been easier to keep things peaceful on the Dummy than in our bucket bike, but that’s probably because the little kid is fully harnessed. If anyone pushes a Dummy to its limits, it’s got to be Family Ride. I like to joke that she is her own Tent City, and I mean it as the highest of compliments. That was what sold me on it, when I needed a new bike fast and didn’t want to try all the things. That said, it sometimes feels like Surly all but ignores its family biking customers. They could do a whole lot to make it better in that way, plus is it really that big a deal to include a chain guard and a dang pair of fenders? I agree with you there. I don’t even have e-assist on my bike and I paid at least $4500 for it. The RJ kickstand and the dynamo lights didn’t come cheap, but they are just about the best things to have happened to my bike. I have a simple Wald basket on the front where I toss my sound system (ha! Really just a speaker), hoodies, snacks, etc. so those things are within reach. I didn’t want a big cumbersome basket welded onto the frame, but I can see where that could be desirable. Anyway, I am surprised to read this! I really did think you’d end up with a BD. Obviously I am in love with my bike and I think it is just the perfect thing for us. But your biggest is older than our kids and if 100 lbs. really is the “real” limit of the bike, then that alone resonates as a dang good reason to look at other options. Verrrrry curious to read your next post! This is a really helpful comment. On reflection I agree that hauling works better when it’s low in the FreeLoaders. That must be part of the reason that the new Edgerunner has a smaller rear wheel; it would be much more stable that way with kids loaded on the deck. On occasion I notice the same top-heaviness on the MinUte; when I’m turning at the end of a steep hill with my son on the deck, the bike pulls a little, like it wants to roll over rather than make the turn. It’s a disconcerting feeling and it’s specific to the heavier load; it doesn’t happen with our (lighter) daughter on deck. Family Ride mentioned the same thing about Surly and biking parents. I guess we’re just not their definition of cool. I really love the frame mounted front baskets and racks, but the kind that slide off and on with one hand are definitely better than the ones permanently attached to the frame. The Workcycles bikes have that kind of easily detachable frame-mounted front racks, and they’re drool-worthy. All that’s left if you don’t want the bulk of the front rack on a particular ride are a couple of braces on the tube. All that said, the choice between the Big Dummy and the Bullitt was difficult for us. We knew we would be keeping the MinUte, and having a bike with the kids in front and that could carry very different kinds of loads than the Big Dummy was a factor–you guys already had a box bike with the Madsen, so getting the Big Dummy strikes me as clearly the right decision in your case. Different circumstances=different choice. Very, very informative as usual, but: ?? But since you mentioned it, well, which cargo bike did you buy? Agree with you about all the crazy names! Many people seem to have lost the point of language as making something clear; you could offer them some lessons. This is such a helpful blog post! I’ve reached many of the same conclusions (and frustrations). I assumed, when I came across this post through a random google search just now, that this was written three years ago. But yesterday? I do want to hear what you’ve decided on, as I’m about to buy a bike and assumed that it would be the Big Dummy. It’s almost perfect. So far, all research has lead to there. But… maybe you know something I don’t know. I can’t wait to find out! We ended up getting the Bullitt! It was a hard decision. Ultimately it was a number of things; having the kids in front, the easy addition of the trailer-bike rack, the way that it complemented our midtail (the Kona MinUte), which can carry many of the same kinds of loads that a Big Dummy can. For a family picking a first cargo bike, or in a different kind of environment, or with kids of different ages, it could easily be another choice. I tended to focus on the issues that came up for our needs, like big hills, two older kids, and heavy traffic, but these are somewhat unusual circumstances. It’s interesting to see the difference in expectations here. I dunno if you ride motorcycles, but generally speaking, the pillion is never supposed to get on or off by his/herself. Basic training; A gazillion two-up motorcycle riders consider this standard-operating-procedure. It’s also standard training that you advise your pillion not to affect the balance w/ drastic movements, as it can be seriously hazardous to your health, if you’re flying down the highway and inadvertently shift over a lane because of an errant hand/head motion. i can see that a bakfiet would be considered significantly safer from a “dynamic load” perspective. I would trust an older kid to recognize the consequence…but younger kids…definitely best to either strap ’em down, or maintain a conservative speed. Unanticipated weight shifts, and high rates of speeds do not mix well. Thanks for the write up. 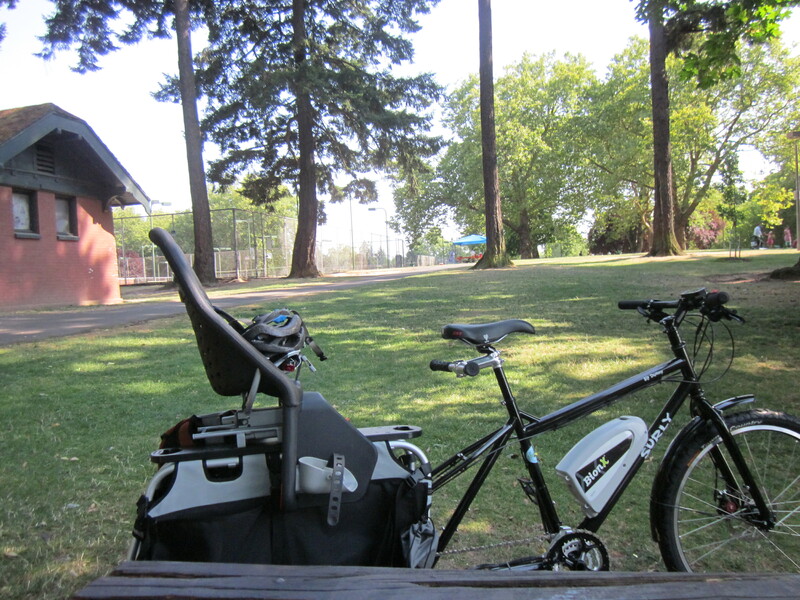 By chance do you know what kind of distance you can get with both kids on the back with the BionX assist on full? I’m thinking about getting a Big Dummy with assist for my side business and I’d be carrying about 100 lbs. Thanks again. I’m afraid that the answer to that depends on the type of terrain and battery (more expensive ones have more range). With a lot of steep hills like we have here, the range of an assist drops substantially. If you want to get an informed opinion I’d suggest contacting The New Wheel here in San Francisco. If you tell them more about where you’ll be riding and what kit you want to buy, as well as the information about the bike, load, and the level of assist that you’ve already given me, they should be able to give you an estimate.